Veg Out St Kilda Farmers' Market | St Kilda, Bayside Melbourne, Australia | Veg Out St Kilda Farmers’ Market, a VFMA accredited farmers market, has been running for over 11 years. It is held on the first Saturday of each month at the Peanut Farm Reserve, Chaucer Street, St Kilda (just behind Acland Street). Veg Out St Kilda Farmers’ Market, a VFMA accredited farmers market, has been running for over 11 years. It is held on the first Saturday of each month at the Peanut Farm Reserve, Chaucer Street, St Kilda (just behind Acland Street). Veg Out St Kilda Farmers’ Market has been running for over 14 years, is an accredited VFMA farmers’ market, and is held on the first Saturday of each month. We are proud to host award-winning farm producers from across Victoria who sell their mouth-watering produce direct to customers, ensuring that the person you buy from is the person who helped make it, bake it, grow it, pick it, pack it, prepare it and love it. 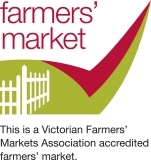 By visiting the Veg Out St Kilda Farmers’ Market you are directly supporting primary producers from around the state. Farmers’ Markets include both certified organic and conventional growers, all with the freshest produce available. It’s certainly not your average shopping expedition. Farmers and producers roll up from across the state. There’s an abundance of fresh, seasonal and organic fruit and veg, free range eggs and meats, olive oils, honey, wines, biscuits, jams, chutneys, mayonnaise, spice mixes, pates, confectionery, ginseng, breads, pasta, artisan cheeses, seedlings and flowers – all in season and low on food miles. Unlike anything else, farmers markets bring a slice of rural life to our city and provide a Saturday morning food gathering experience like no other. All goods are grown and made by those who sell them and the quality of produce is of the utmost importance. The market is plastic bag free, so bring baskets, bags or trolleys and re-use your old plastic bags. It’s also a great place to catch up with locals, with breakfast and coffee available. See you there!